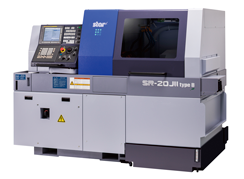 Star Micronics has developed a new Swiss type automatic lathe (Note 1) model “SR-20JII” in the SR series, which is scheduled to be released in May, 2018. The original model, “SR-20J” launched on the market in 2008, has been highly rated because of its high rigidity in all kinds of parts processing markets related to the automobile, medical and other industries. Like the model “SR-32JII” released last year, the renewed model employs a modular design and production system in order to reduce the lead time required for development and manufacture. The gang-type tool post for front working is equipped with the Star original slanted slide guideway structure (Note 2) from the previous model. Enhanced rigidity of the tool post achieves accurate continuous machining for a long time. In order to respond to diversification of needs for parts processing, the guide bush switching mechanism is introduced. With only a single machine, the guide bush type, which functions as a steady rest to enable accurate machining of long parts such as motor shafts, and the non-guide bush type (Note 3) which achieves machining of short parts such as nuts, etc. by reducing the residual materials to discard, can be switched over. The non-guide bush type, in particular, is designed to improve the rigidity of the entire machine by employing a spindle sleeve slide guideway structure (Note 4) in order to ensure the headstock rigidity by supporting the cutting load generated during machining with the slide guideway. Furthermore, the flip-up mechanism is used for the door of the cutting chamber and the headstock chamber each to ensure a sufficient work space inside the machine. A swing-type panel facilitates machine operation at an optimum position. The NC unit is equipped with various help functions including an alarm help function for checking alarm contents on NC screens to improve operator’s operability and workability in terms of both the software and machine sides. The gang-type tool posts adopt a slanted slide guideway structure with high rigidity. The non-guide bush type incorporates a spindle sleeve slide guideway structure. The slide guideway supports cutting force to ensure the headstock rigidity. Type B tool post designed for backworking employs a slanted dovetail structure on the Y2-axis slideway to achieve rigidity of the tool post. Either the guide bush type or non-guide bush type can be selected according to the total length of parts to be machined. Type A tool post designed for backworking is equipped with a 4-spindle unit. By combining with optional units, a power tool unit can be mounted at all positions. Type B tool post designed for backworking has an 8-spindle unit with Y2-axis control function. A power tool unit can be mounted at all positions as standard. With the Swiss-type automatic lathe, the rear side of a bar material needs to be handled as waste as a portion equivalent to the size of the guide bush structure which functions as a steady rest for the material cannot be machined. The non-guide bush type reduces the waste to about 1/3 in length compared to the waste made by the guide bush type.